Find A Babysitter - What Do You Do When You Find Out That You are Babysitting a Child AND a Dog? What Do You Do When You Find Out That You are Babysitting a Child AND a Dog? During your time as a babysitter you are bound to find yourself in a situation where you are looking after a child AND a dog. So, what do you need to know if this does happen?  Is the dog allowed inside, or certain areas of the house and yard? In what situations are they allowed where?  Is the dog trained to respond to certain commands? And what are these?  Where does it eat and sleep? Even if you are told the dog is friendly and placid, remember that dogs can be quite territorial and may act out of character with a 'stranger' in their home. It may be beneficial to arrange to 'meet' the dog with the owner before the actual babysitting event to make sure all parties are comfortable.  Are the dog and the child allowed in the same room as one another?  What areas are 'out of bounds' for the dog and/or the child?  Do the two interact with each other? 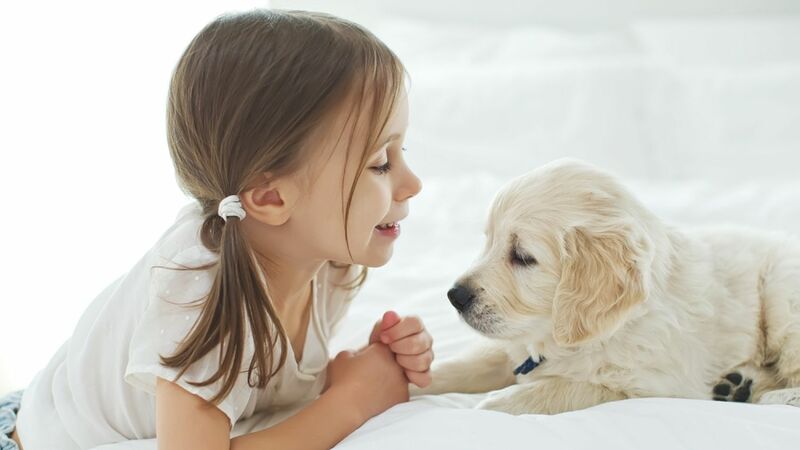 If you are told the child and the dog are best friends and play together regularly – great! However, remember that SUPERVISION is crucial, never leave a child and a dog alone together. Dogs can be unpredictable and any dog can bite, no matter the breed or size - even the friendliest dog! While supervising the dog and the child together, keep an eye on the dog's body language. This can provide a good indication on how a dog is feeling and whether or not the two should be separated. Children may unintentionally hurt or upset a dog e.g. by pulling on their tail, tugging on their ear or giving them a poke in the side - and they are not able to recognise warning signs that a dog may give. As a general rule of thumb, dogs should be left alone if they are: lifting their lip, growling, backing away or if the hair raises on their back. If, for any reason you are unable to actively supervise the child and the dog, then you should separate the two by taking the child with you when you leave the room, or putting the dog outside if appropriate. Like all of us, sometimes dogs enjoy personal space so there are some key times when you should ensure that a dog is left alone e.g. when they are eating (nobody wants to be poked or prodded while having their dinner! ), sleeping, lying on their bed or playing with their toys. Following these few simple steps can help you to make sure that both the child and the dog you are minding are kept safe and happy. For more information, please visit www.kidsafe.com.au.